Heat oven to 400°F. Line 15x10x1-inch pan with foil; lightly spray with nonstick cooking spray. In small bowl, mix ricotta cheese, 2 tablespoons of the honey and 2 teaspoons of the lemon peel. Spread about 1 rounded tablespoonful mixture evenly on each slice of bread. Place 3 raspberries on top of cheese mixture on 4 slices bread. Top with remaining slices to make 4 sandwiches, pressing lightly. In shallow dish, beat egg, milk, salt, vanilla and cinnamon with whisk. Place sandwiches in egg mixture; soak 5 minutes. Carefully turn each sandwich over; soak 5 minutes longer. Transfer to pan. Bake 13 to 15 minutes or until golden brown. 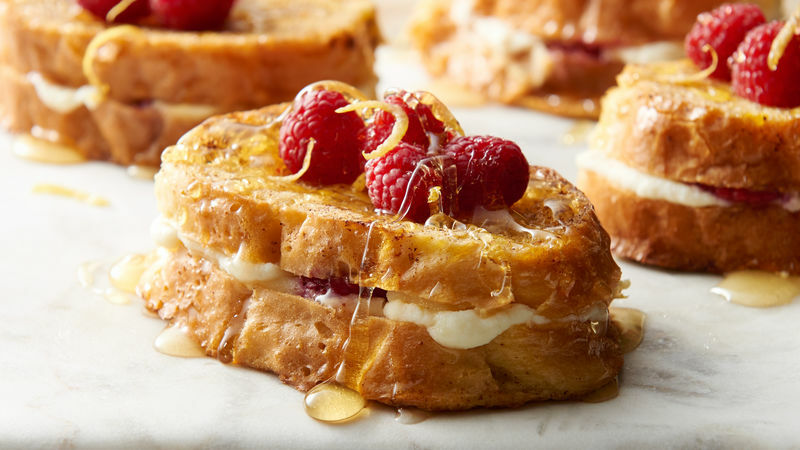 Top each sandwich with remaining raspberries; drizzle with remaining 2 tablespoons honey, and top with remaining 1/4 teaspoon lemon peel. Ricotta cheese is used in this recipe because it is lighter in texture and easier to spread than cream cheese, which is typically used in French toast fillings. Substitute blackberries or blueberries for the raspberries.